Improving hurricane prediction models requires better understanding of complex processes taking place at the air-sea interface at high wind speeds. The change of the air-sea interaction regime in hurricane conditions has been linked to the mechanism of direct disruption of the air-sea interface by pressure fluctuations working against the surface tension force. This can be achieved through the Kelvin-Helmholtz type instability. In order to investigate this mechanism, we have conducted a series of 3D numerical experiments using a volume of fluid multiphase model. The experiments were initialized with either a flat interface or short wavelets and wind stress applied at the upper boundary of the air layer. 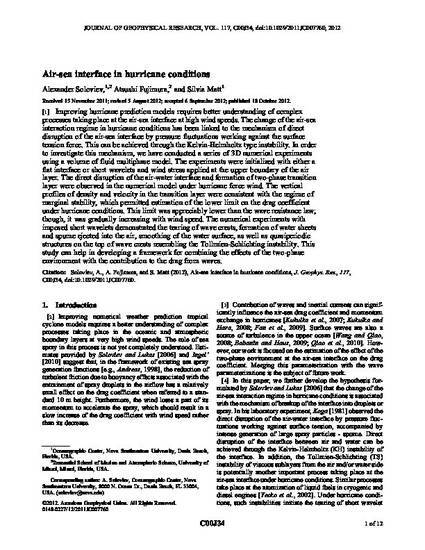 The direct disruption of the air-water interface and formation of two-phase transition layer were observed in the numerical model under hurricane force wind. The vertical profiles of density and velocity in the transition layer were consistent with the regime of marginal stability, which permitted estimation of the lower limit on the drag coefficient under hurricane conditions. This limit was appreciably lower than the wave resistance law; though, it was gradually increasing with wind speed. The numerical experiments with imposed short wavelets demonstrated the tearing of wave crests, formation of water sheets and spume ejected into the air, smoothing of the water surface, as well as quasiperiodic structures on the top of wave crests resembling the Tollmien-Schlichting instability. This study can help in developing a framework for combining the effects of the two-phase environment with the contribution to the drag from waves.